For other uses, see Aspect ratio (disambiguation). The aspect ratio of a geometric shape is the ratio of its sizes in different dimensions. For example, the aspect ratio of a rectangle is the ratio of its longer side to its shorter side – the ratio of width to height, when the rectangle is oriented as a "landscape". The aspect ratio is most often expressed as two integer numbers separated by a colon (x:y), less commonly as a simple or decimal fraction. The values x and y do not represent actual widths and heights but, rather, the proportion between width and height. As an example, 8:5, 16:10, 1.6:1, ​8⁄5 and 1.6 are all ways of representing the same aspect ratio. In objects of more than two dimensions, such as hyperrectangles, the aspect ratio can still be defined as the ratio of the longest side to the shortest side. Display aspect ratio: the aspect ratio for computer displays. Photolithography: the aspect ratio of an etched, or deposited structure is the ratio of the height of its vertical side wall to its width. For a rectangle, the aspect ratio denotes the ratio of the width to the height of the rectangle. A square has the smallest possible aspect ratio of 1:1. 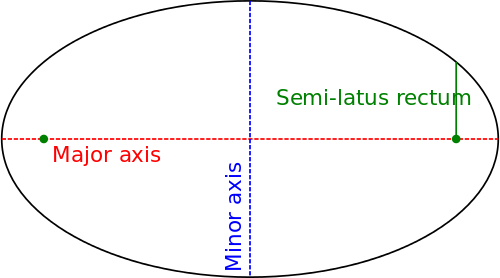 For an ellipse, the aspect ratio denotes the ratio of the major axis to the minor axis. An ellipse with an aspect ratio of 1:1 is a circle. The diameter-width aspect ratio (DWAR) of a compact set is the ratio of its diameter to its width. A circle has the minimal DWAR which is 1. A square has a DWAR of sqrt(2). The cube-volume aspect ratio (CVAR) of a compact set is the d-th root of the ratio of the d-volume of the smallest enclosing axes-parallel d-cube, to the set's own d-volume. A square has the minimal CVAR which is 1. A circle has a CVAR of sqrt(2). An axis-parallel rectangle of width W and height H, where W>H, has a CVAR of sqrt(W^2/WH) = sqrt(W/H). If the dimension d is fixed, then all reasonable definitions of aspect ratio are equivalent to within constant factors. Aspect ratios are mathematically expressed as x:y (pronounced "x-to-y"). Cinematographic aspect ratios are usually denoted as a (rounded) decimal multiple of width vs unit height, while photographic and videographic aspect ratios are usually defined and denoted by whole number ratios of width to height. In digital images there is a subtle distinction between the display aspect ratio (the image as displayed) and the storage aspect ratio (the ratio of pixel dimensions); see Distinctions. ^ Rouse, Margaret (September 2005). "What is aspect ratio?". WhatIs?. TechTarget. Retrieved 3 February 2013. ^ Smith, W. D.; Wormald, N. C. (1998). "Geometric separator theorems and applications". Proceedings 39th Annual Symposium on Foundations of Computer Science (Cat. No.98CB36280). p. 232. doi:10.1109/sfcs.1998.743449. ISBN 0-8186-9172-7.